We have much to learn about this case. Will you help us? We need a photo of Hope shortly before her death, a newspaper account, the police report…anything we can do to post this. Hope’s dead body was found on Van Slyke Rd near the Bristol Rd intersection across the street from the General Motors Assembly Plant in Flint, MI. At that time there was a Unemployment Office there with a huge empty field behind it. Her body was found in that field. She was 7 or 8 months pregnant. 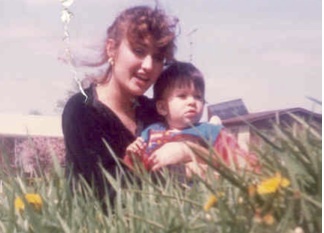 Her killer was never found. 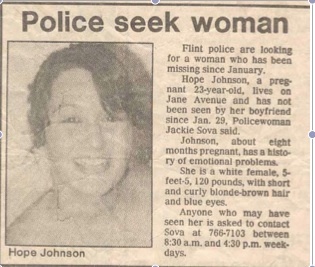 The missing person report was made by her boyfriend who had last seen Johnson on 1-29-88. Johnson was last seen in the area of Jane and Broadway on Flint’s east side. Johnson was last seen wearing a ¾ length white coat, white pants and gray snow boots. Johnson was also 8 months pregnant. On 3-12-88, Flint Township Police responded to G-4150 Van Slyke in reference to a body found in a wooded area at that address. Responding officers did find the remains of a female body. The body had been at that location for quite some time. A subsequent autopsy showed that the manner of death was homicide. The body was also identified as being that of Hope Johnson. Anyone with any information regarding the homicide of Hope Johnson is asked to contact the Flint Township Police Detective Bureau at 810-600-3250. Information may also be sent by email to this website. Detective Sergeant Gene DuBuc. Posted on Sunday, September 1st, 2013 at 11:33 am. Last updated on Sunday, September 1st, 2013 at 11:52 am.